A super cheesy, fragrant and flavorful basil hemp seed pesto that is completely vegan and gluten free! Made with Basil, walnuts, garlic, lemon juice, hemp seeds, nutritional yeast and olive oil. Perfect with just about everything. By now you probably are well aware that I love love love pesto. I mean if the food is in the blog name that’s got to mean something, right? Exactly. Since the first time I tried it I have been hooked and I mean hooked on pesto. It’s pretty much the best thing ever. And goes with just about everything. It can be a sauce for pasta, a dip for crackers, a spread for cold cuts or sandwiches, etc. I have not yet found a dessert recipe to use the pesto in, but just you wait, it’s coming. It’s only a matter of time before I get there. When I come home starving, and there’s pesto in the fridge I simply need a cracker and my hunger has instantly been tackled. It’s that simple. I literally did this the other day. After sitting in rush hour traffic for two hours to get to the Inbound Marketing Conference in Boston and being there for a few hours I was starved when I got home. With this handy jar of pesto patiently awaiting my arrival in the fridge I was perfectly at ease. Seriously though, how do people sit through insane rush hour traffic day after day, twice a day? Two hours to go 35 miles just simply is not right. After just a few days of driving in to Boston like this I instantly have a new found respect for pretty much anyone that commutes into a city in that kind of manner. I just feel like by 2015 the whole traffic problem should have been sorted out already. Don’t you think? Why are we still wasting hours, piled into days of time in bumper to bumper traffic. I am eagerly awaiting technology’s solution to this. I mean what do people do for all those long hours sitting in the car, having to be alert at the wheel. Is everyone just fuming with road rage? Listening to morning talk radio? Learning something valuable during a podcast? It’s incredible people aren’t just throwing complete temper tantrums in their car. I mean maybe it’s just me. Maybe other have a much high traffic tolerance. I couldn’t do it though. Traffic simply turns my skin inside out. If I don’t have some serious distractions in the car – cue passenger in the side seat, watch out. This is exactly why I need to be a food blogger. I need to be able to stay home during that morning commute and eat pesto. Ah yes pesto. 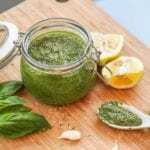 Back to this basil hemp seed pesto recipe. I used to make pesto with Parmesan cheese (back when I also didn’t have a clue about food photography, apparently), and then I used to make it vegan with no cheesy substance, and now I have taken things to a new level, introducing the vegan basil hemp seed pesto, with the addition of hemp seeds and nutritional yeast – to bring more cheesy nuttiness to the mix while staying vegan. Best vegan basil hemp seed pesto ever right here. And for all the non-vegans out there you won’t even know there’s no cheese here! 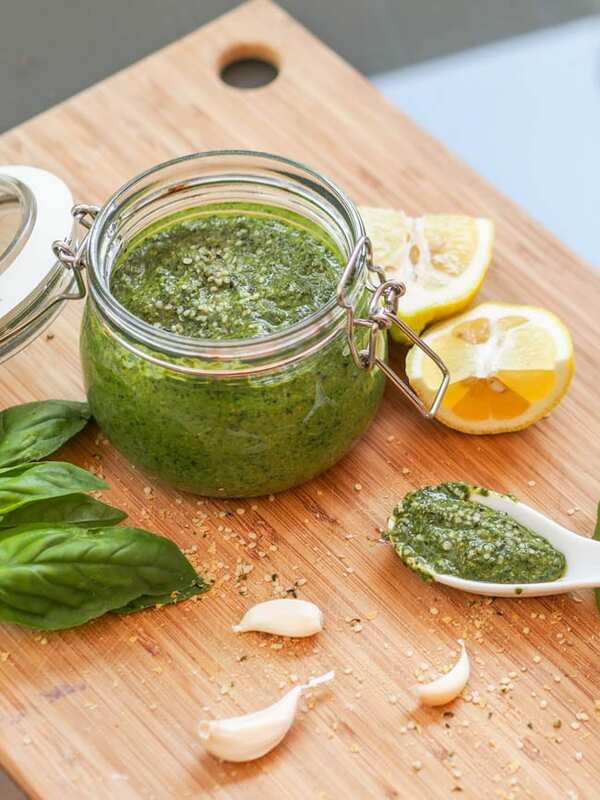 A super cheesy, fragrant and flavorful basil hemp seed pesto pesto that is completely vegan and gluten free! Made with Basil, walnuts, garlic, lemon juice, hemp seeds, nutritional yeast and olive oil. Perfect with just about everything. Nutritional yeast is one of my favorite ingredients. I don’t think I ever liked cheese as much. It’s unique. I looove nutritional yeast. I can’t believe I just spotted it in the grocery store for the first time last year. I’ve really been missing out! How long will the pesto keep in the refrigerator? Love your recipes. This sounds amazing! I LOVE the addition of hemp seeds…can’t believe I’ve never thought to add them to pesto before (LOVE those little seeds!). Can’t wait to try this! I’m new to dairy free eating and am lost with finding the nutritional yeast in stores…is it the same as nutritional yeast seasoning? Yep it’s the same as nutritional yeast seasoning. I also had trouble finding it in stores at first, and then found it in the spices or nuts section. Could help to ask one of the employees they might have a better idea of where the store stocks it. Good luck! So is nutritional yeast the same as brewers’ yeast? Years ago I tested to be allergic to brewers’ yeast, so thought that I should ask. If it’s the same, can something else be substituted, or should I simply omit it? If you want to be careful just omit the nutritional yeast. It will still be delicious! I have never used nutritional yeast but I’ll have to try this out!! Nutritional yeast is the best for replacing that cheesey flavor in vegan recipes! This pesto can be made without it though too.